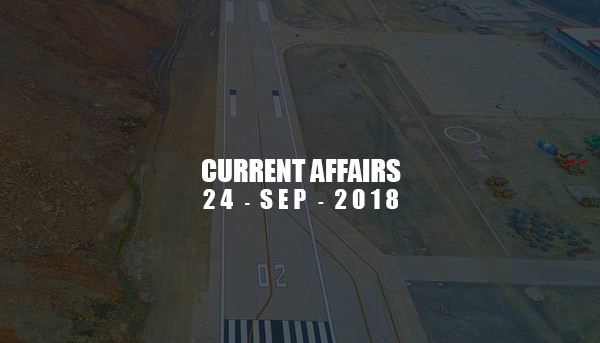 Current Affairs - Sep 24, 2018 - IAS - Daily Current Affairs, IAS Syllabus Exam Strategy, IAS Preparation. It will be the first airport at 4500 feet above sea level. This new Pakyong Airport is situated near Gangtok, capital of Sikkim. It has been built at a cost of over Rs. 600 crores. Maldives' opposition candidate Ibrahim Mohamed Solih has won the presidential election. He received 134,616 votes compared to 96,132 votes of incumbent China backed President Abdulla Yameen Abdul Gayoom. Gayoom has conceded the defeat followed by hours of silence after the announcement of result by Election Commission. Voter turnout was 89%. Many international observers raised their concern over rigging election in favor of Gayoom. The US and India have welcomed Mr. Solih's win. Mr. Yameen had drawn the Maldives closer to China, which has stepped up its presence in the Indian Ocean in recent years. Mr Solih entered the Parliament for the first time after defeating a ruling party candidate in 1994. He has been representing ‘Lhaviyani Atoll’ in the Maldivian Parliament. Many opposition politicians in the Maldives have been jailed under Mr. Gayoom, and the US and European Union had threatened sanctions before the vote if the democratic situation did not improve. Flipkart co-founder Binny Bansal is likely to be replaced by a new Group CEO in now Walmart controlled Flipkart. Binny Bansal took over this position after its founder Sachin Bansal left the startup. Walmart has acquired a 77 percent stake in Flipkart for $ 16 billion earlier. Global research agency Fitch raised India’s growth forecast for the current fiscal to 7.8% from the earlier 7.4%. Fitch has revised the forecast for current fiscal ‘on the back of the better-than-expected 2018 outturn’. Fitch’s latest projection for the current fiscal is higher than what is estimated by the Reserve Bank of India (7.4%) and even the Government (7.5%). Assamese movie ‘Village Rockstars’ has been selected as India’s official entry to the Oscars 2019. This winner of Best Feature film Award at the 65th National Film Awards was directed by Rima Das. The film which had its World Premiere at the Toronto International Film Festival and India premiere at the Mumbai Film Festival 2018. Irrfan Khan’s Doob – No Bed of Roses is Bangladesh’s official entry for Oscars 2019. Nepal's wild tiger population has reached 235, nearly doubling the baseline of around 121 tigers in 2009. US President Donald Trump is going to address UN General Assembly UNGA next week, before that he has said that the United Nations (UN) has not lived up to its "tremendous potential". BSNL has inked a pact with Japan’s Softbank and NTT Communications to roll out 5G and internet of things (IoT) technology in India. Japanese space agency’s MINERVA-II1 (Micro-Nano Experimental Robot Vehicle for Asteroid, the second generation) is the world’s first rover to land on the surface of the asteroid Ryugu.​​ It consisted of two rovers, Rover-1A and Rover-1B.